AZS fused cast bricks Name (fused zirconia corundum bricks). It is cast in the mold material is completely melted. Cooling, made after solidification. AZS fused cast bricks is mainly used in the glass furnace. This product shrinkage during condensation caused by volume shrinkage is a matter of special attention should be used. Casting cast AZS bricks way as ordinary casting, tilt casting, no shrinkage of casting and quasi-shrinkage casting. Different ways cast AZS products to meet the ceramic frit kilns sodium silicate kilns glass furnace various parts of the application requirements. It is resistant to erosion, corrosion resistance, long life, the current general use: fused oxidation-casting. 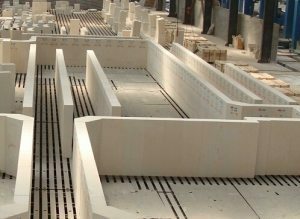 AZS fused cast bricks change has three important driving force of development. glass manufacturers often need to change the quality of glass supply and demand. These three requirements are usually decided when the change of elective repair kiln bricks. The driving force also contributed to glass manufacturers furnace maintenance at Nursing elective change the operating cycle of refractory products and introducing new skills when picking up a wide range of repair. Pouring molten aluminum brick compound melting tank top This site has been established in its application, it is important oxygen combustion glass melting tank furnace quality applied. Before the advent of oxyfuel skills. Only βˉ aluminum compounds are used for melting tank top bricks structure, and there is no pouring molten aluminum bricks compound is used on top of the molten pool. Now, no matter βˉ aluminum compounds also α-β compound pouring molten aluminum products are produced with gorgeous movie (funnel), on float glass and borosilicate glass tank furnace oxygen combustion part or all of the roof. Pouring molten AZS ordinary bricks can use to 1600 ℃ or 1650 ℃ (in that glass products), but can be very successful run at 1700 ℃ electric melting aluminum brick roof.